U.S. Equity Shareholder Yield - Epoch Investment Partners, Inc.
Seeks superior total and risk-adjusted returns with high dividend income and below-market volatility. 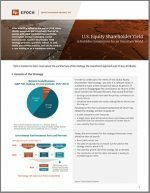 Our U.S. Equity Shareholder Yield strategy pursues attractive total returns with an above-average level of income by investing in a diversified portfolio of U.S. companies with strong and growing free cash flow. Companies in the portfolio possess managements that focus on creating value for shareholders through consistent and rational capital allocation policies with an emphasis on cash dividends, share repurchases and debt reduction — the key components of shareholder yield. The portfolio generally holds between 75 and 120 stocks, with risk controls to diversify the sources of shareholder yield and minimize volatility. repurchases and debt pay downs. An essential factor is the evaluation of each company’s management team to confirm their commitment to transparency and building shareholder value. The companies uncovered by this process typically have inherently less volatility due to their ability to generate cash flow. characteristics we are looking for with less risk. environment and macroeconomic and industry trends. We analyze risk as part of the portfolio construction process to monitor portfolio volatility and better ensure the delivery of the strategy’s goals. A senior member of the Quantitative Research and Risk Management team is a co-portfolio manager on every strategy managed by Epoch so that portfolio managers are aware of unintended biases and the effect individual securities may have on the portfolio. The portfolio is diversified across sectors and sources of yield so that no single stock is relied on too heavily to achieve the portfolio’s yield targets.